This was revealed alongside the spirit card for Priests, Spirit of the Dead. Looking to learn more about Hearthstone's tenth expansion? Visit our expansion guide for Rastakhan's Rumble! If we see many powerful 1-cost minions and if the priest spell Surrender to Madness creates a whole new archtype, then this card will be staple there. However I don't see why people are freaking out over this card. It just a card draw on turn 7. And you draw weak and most likely non-impactful cards. [edit 2] I didn't see the Spirit card. 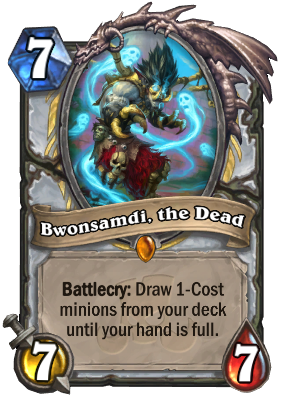 WoW, with the spirit card Bwosamdi has the potential to create combo priest decks. Interesting. Add me on NA, 2gr82b4got10. I like this card very much. Reminds me of Call to Arms. But now a Deck with this, Spirits and Surrender to Madness with 12 1-Drops seems very fun. not a big fan of the art or the effect, but it is undeniably powerful if it works. It's obvious what this card is trying to do with spreading madness, spirit, etc...but it's just good on it's own too. Will probably find use in a bunch of things for priest. Draw engines are always welcome, but, oh boy, i'm scared if combo priest ends being consistent enough with the Spirit of the Dead we could have Druids combos in priest. Oh man... Spirit of the Dead + Zerek's Cloning Gallery with one Radiant Elemental + Spirit Lash + Bwonsamdi, the Dead the following turn... Damn that value! Besides the obvious combos, it can work as another Hemet in Mechathun priest, if enough new 1 drops are printed that make sense in that deck. More like Priests should pray that Academic Espionage doesnt give a Rouge Bwonsamdi. If you are in your first year of playing please read this post. Dust does not burn a hole in the jar. Be careful what you craft, especially before and after a rotation. I'm wondering if this card requires too much setup for it to be good or not. The new Spirit of the Dead card is a great start and if priests find more ways to shuffle powerful 1 mana minions into their deck, I can easily see this being a Tier 2 deck in the upcoming meta. Will be interesting to see what other cards are added to Priest. At the moment it seems like this would only be playable alongside Spirit of the Dead and even then only if you got decent value from that. It seems like you could easily get some serious shennanigans going with them though, especially once you add in Boomsday's cloning cards. What I like about this card is that I'm not sure it needs anything else besides Spirit of the Dead and Northshire Cleric to be good. Four 1-mana minions should probably be enough for this to be a 7-mana draw 2. If you've copied anything with Spirit of the Dead, that becomes even more reasonable. Seems really good especially with its paired spirit card. Hoping this is indicative of a strong power level for the other cards/classes and lots of new strong decks for the expansion. Last expansion was lacking in power, with pretty much just dr boom 2 being a great new deck introducing card. This is a strong card and finally one that gives a sense to previously released or revealed cards. It gives sense to Gallery, Reckless Experimenter, Madness, Spirit, Gargoyle, Piper, Banker... and old bois like Velen, Maly... The strength of the card lays in its versatility. It'll be interesting to decksperiment. I think this is just a good card period. Priest has plenty of good one cost cards that it wouldn't mind pulling from the deck, and this card's stats are just on curve anyway. This... feels like a meme in a way because you still have to draw him to get the drawing mechanism. However, I could be wrong. His effect is powerful along with its spirit. Weasel priest will be back!